James' Jetsam - Your Cruise Expert: Can you cruise if you're a Sikh? Probably not, which is a shame I think. At least you can't if you're an orthodox Sikh anyway.I had an enquiry about this a day or two ago about cruises from Southampton and I thought I'd share with you what I'd learnt today. Before I tell you why they can't cruise a quick bit of info might help about what makes a Sikh orthodox. 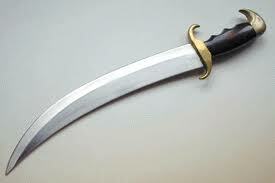 Kirpan - A strapped, curved sword. Although adhering to these isn't necessary to call yourself a Sikh they are the articles of faith for anyone who wants to consider themselves an orthodox Sikh so they have to have these with them at all times. You obviously can't take a knife onboard a cruise ship. Or can you? The issue then obviously becomes however if they do try to take it and you don't want to board you're not allowed any kind of refund. Not sure I'd be happy leaving it to the last minute to find out if I could cruise but it was still the most positive response I had. What do you think? Is this a form of discrimination from the cruise lines or just a safety issue; I can kind of see both sides point of view. I know I wouldn't be happy with the ides of people onboard carrying knives but by the same token I wouldn't like to think of a group missing out. What side of the fence do you fall on? By the way, the above is all about cruise only options from Southampton, I couldn't find any information at all about flights. Does anyone know how orthodox Sikhs get around this?